For better or worse, bitcoin has everyone’s attention. Anyone even remotely aware of the cryptocurrency’s increasingly wild price swings would recognize a full-blown mania, just as those on the periphery of the Dutch tulip bulb craze of 1636-37 must have known that it would end badly. For now, however, bitcoin has been a big winner for virtually everyone who bought before Monday and held onto it. But it is attracting a growing number of speculators who think they can do even better by trading the swings. When the CBOE and CME unleash their respective bitcoin futures contracts over the next two weeks, it will likely reduce intraday volatility, at least initially. 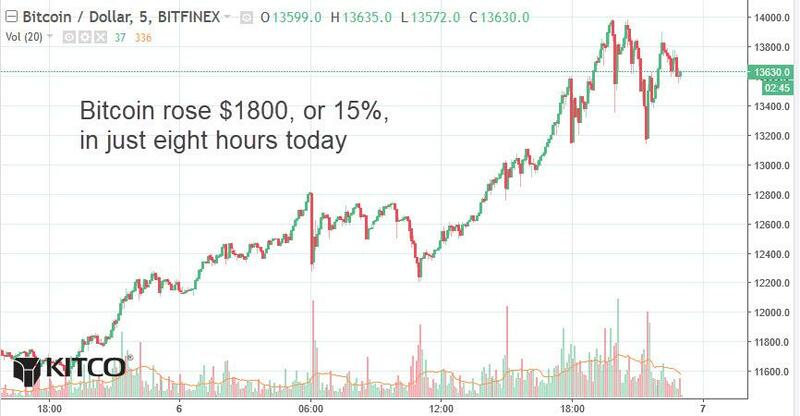 But watch out if the mania lasts long enough for bitcoin options markets to build up a head of steam. Premium levels for bitcoin puts and calls will be stratospheric, tempting short sellers to get in over their heads. Way over. The Mother of All Short Squeezes is most surely out there, lurking behind a product that paradoxically will settle in cash. Although short sellers won’t have to cough up actual bitcoin, they will still have to cover positions gone dangerously awry whenever bitcoin fever spikes. When that happens, $1500 swings like the one that has occurred this evening will seem as mellow as church bingo.